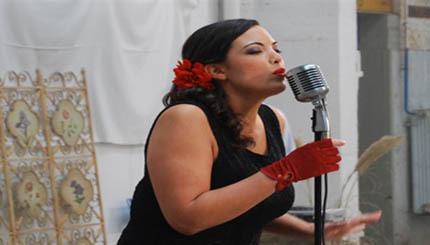 Caroline Esmeralda van der Leeuw (born 26 April 1981 in Amsterdam), better known by her stagename Caro Emerald, is a Dutch jazz singer. She debuted on 6 July 2009 with her single "Back It Up". Her debut album Deleted Scenes from the Cutting Room Floor set an all time chart record on 20 August 2010 by spending its 27th week at number one on the Dutch album chart, beating the previous record set by Michael Jackson's Thriller by one week. Ultimately, the album would spend a total of 29 weeks in the number one position on the Dutch Albums Top 100 list. On 3 October, 2010, Van der Leeuw was awarded the Dutch Music Prize "Edison" for Best Female Artist.